Choose and print your photo. 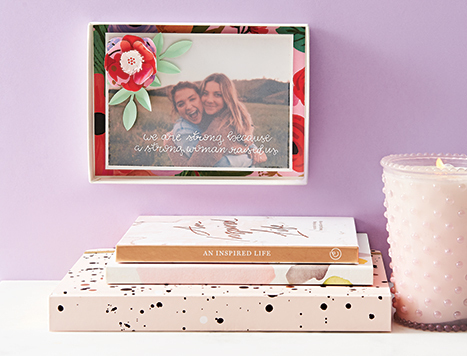 If you are using the small photo box, a standard 5″ x 7″ photo is recommended. Cut vellum paper to the size of your photo, and cut decorative paper (we used Garden Party Flat Wrap) to fit the inside of your box. 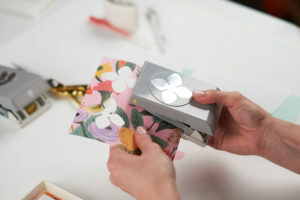 Use tape runner along the back edges of the decorative paper and adhere it to the inside of the box. Write a message on your vellum paper using a gel pen. 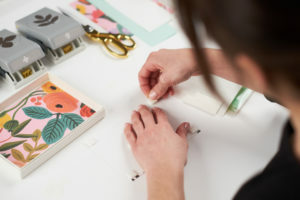 Use tape runner along the back edges of the vellum paper and attach to the front of your photo. Flip photo (with attached vellum paper) over and apply two layers of foam squares to the back. Place squares in the center of the paper and in each corner. Flip photo back over and carefully place in the center of the box. Attach flowers at center with Zots, staggering the petals as you stack them.